We were delighted to read an article by George Monbiot in The Guardian online recently which attacks us directly. Oh dear, oh dear, has George Monbiot exposed himself as yet another establishment minion we must now ask ourselves? 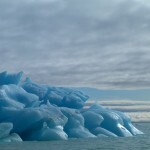 A prolific environmental blogger who was snapped up by the Guradian some time ago, he has decided, or been told, to dive eyes shut and nose pinched into the world of Climate Engineering and has, at a stroke, worked it all out. He obviously now knows more about this than we do and has cast his new-found wisdom on the subject to the wider world who seem to be, much to the annoyance of the establishment, coming round to accepting that what we are proposing does actually make sense and could, however painful it may be to accept, actually be happening. In the same way that those who seek to try to convince us all that a long-standing, straight-talking and highly respected politician who gained one of the largest majorities in recent political history to become leader of the opposition is somehow an “insurgent” (Radio 4 breakfast presenter/reporter – Nov 2015), his exaggerated and unfounded attack on Look-Up.org.uk and our campaign actually casts suspicion on him and is likely to make the more astute in society more open to our evidence rather than turn them away. His recent article about our campaign is littered with easily identifiable examples of damage limitation, NLP and some rather lame assumptions, untruths and insults. Surely if you are a respected blogger and want to take on an increasingly well-known campaign website that has spent 3+ years relentlessly investigating and successfully uncovering something of unimaginable magnitude, with lots of very convincing physical and circumstantial evidence combined with sensible and reasoned debate, then one would expect a little more of an analytical and reasoned approach from the author but no, all we read is the usual “it’s all rubbish, they are all bonkers and if you believe them so are you” rhetoric. How lame and predictable; propaganda 101 and the kind of shallow and obvious nonsense we would expect on Facebook, but not in a national paper. Fred the tramp used to sit on the bench in South Harrow and drop painkillers into his super-strength lager. He would tell us stories about how he used to be a scientist and discovered cures for things, but was discredited and bankrupted by the drug companies. None of us believed a word he said, but we smiled and occasionally joked with him and about him afterwards. As far as I remember nobody set up a website to discredit him, made spurious accusations about him, called him names or tried to discredit him seriously to others in the national press. Nobody would bother investing large amounts of time or money into trying to prove what he said was lies, because there seemed no point. So when you look at highly organised counter information including well-presented websites that deal simply with the process of trying to debunk evidence that shows illegal activity, one should question their motives and indeed, their very existence. Why bother? If we really were mad and paranoid one would expect them to simply laugh and ignore us. When we then look at George Monbiot’s article with this in mind it seems clear what is going on. It makes little sense and does not stand up to scrutiny at all, so rather than taking it at face value simply as an ill-conceived and emotional outburst we feel it reasonable to consider the possibility that it has been carefully crafted to undermine our information and convince those on the fence to look away rather than look up. It is highly unlikely that the author has written this purely because he was frustrated by people he knew saying they believed us, as he suggests, but more likely he has been asked to do this. Dissuade the less astute from delving any further. Rather oddly the article also admits that a belief in our information is now so pervasive that it has forced our government to officially attempt to deflect attention from it. This is a very interesting development for us as it shows that people at the very highest level are now so concerned about what we are doing that they feel the need to release official statements to try to counter what we say. Even more fortunate is the fact that the government attempt to do this is so laughable, as we discuss further on, that they also are likely to have bolstered our case rather than weakened it. All in, the establishment disinformation machine is seriously lacking in credibility and probably doing more to help us than to harm us. During his rant Mr Monbiot refers to our information as vague, so rather than retort with an equally emotional and rambling counter-rant, and in view of the fact there is an awful lot of information or disinformation if we are to use the correct term, we have decided to dissect it and respond point by point. We are aware that you have been bleating about CO2 emissions from aviation for a long time, but sadly your message is both misguided and inaccurate. Aviation never used to produce cloud cover, but it does now and in huge amounts, blocking our sunshine on most days. For you to claim that our stance is perverse is quite amusing as anyone over 40 will know that is a fact, so how is our campaign perverse? You wrongly claim that emissions from aviation affect our climate, promoting the CO2 = warming myth. We do not believe that Global Warming exists. Average mean global surface temperatures have not risen for 20 years, despite an increase in CO2 of around 20 ppm, which is why the establishment had to re-brand it as Climate Change. We are not alone either. Apparently a huge percentage of the thinking population no longer believe in the Global Waring/Climate Change hoax. We do not believe that CO2 causes warming or that natural emissions from an industry that, if operated efficiently, represent any threat to us or our environment at all. We have long claimed that the entire situation stinks purely because nobody will admit publicly that cloud cover produced by aircraft emissions are the real cause of AGW. We have repeatedly challenged The MET Office and complicit climate scientists who completely deny that aviation emissions have any noticeable effect on our weather or AGW at all. Nothing has ever been printed in any mainstream media that takes this point and highlights it seriously in the context of the Global Warming debate so you are misleading your readers from the word go. “the multiplying impacts of the water vapour and other gases the planes produce” has no scientific meaning. Water vapour cannot form persistent contrails. Only additives to the fuel or exhaust gases can form persistent contrails which result in cloud-like formations. We agree that the exclusion of aviation emissions from the talks is ridiculous so you seem to be in agreement with us to a point but why do you not acknowledge that it has been a deliberate policy of the minority complicit scientific community and governments to deliberately exclude them so as to lay the blame on global, ground-based industry in developing countries so they can then spend billions of $s wasting everybody’s time trying to create international agreements that mean nothing and benefit nobody. Is it really possible that all the complicit climate scientists have failed to notice that planes are creating so much cloud-cover now that it might, just might, have an effect on our weather and warm the atmosphere. Have they also failed to notice that when it is cloudy in the winter, it is unnaturally warm, and when there is no cloud it is bloody freezing, and that it only seems to get cloudy when lots of planes fly over, and that when we see no planes we have lovely clear days ? HELLO ? How can we take you and these ‘scientists’ seriously? No amount of alarmist statistics and graphs of doom will override basic common sense. We are being lied to ! Sadly, though, Mr. Monbiot is not able or willing to acknowledge the fact that it is not actually natural emissions at all. Water vapour from jet engines does not condense above -57 Celsius, a temperature which is not often found below 37,000ft in a temperate zone. 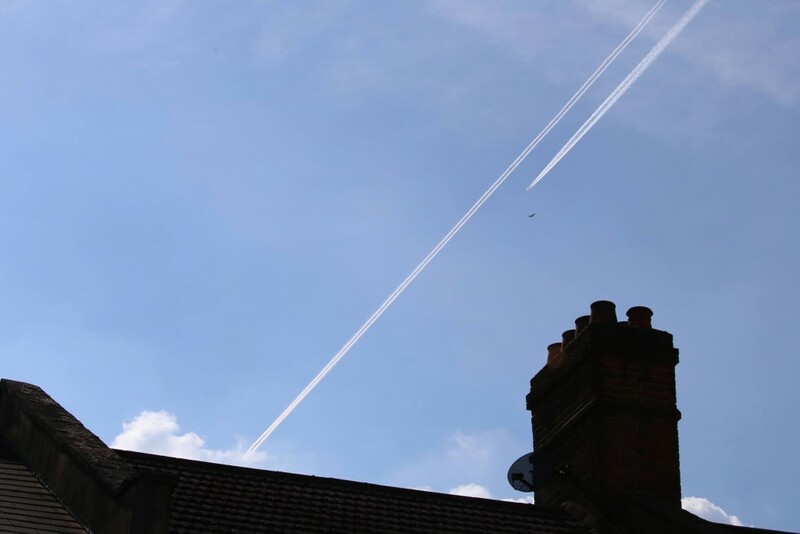 We regularly see aircraft leaving many different types of trails as low as 18,000ft over London, even on hot summer days. Impossible. Read more here in our article 10 Reasons Why The Trails Cannot Be Natural. To some extent we can only speak for ourselves here, but we do represent a similar line on the subject to most other people who are campaigning against deliberate aviation pollution, known as Climate Engineering – referred to by its American term Geoengineering by the author. To suggest we have no interest in its contribution to warming is laughable, as that is one of the primary message of this website and others like it that the clouds produced by deliberately introduced aviation emissions are causing warming. This statement shows the author has either not read the website(s) or is again trying to mislead his readers. Either is pretty poor journalism! Leaving aside whether the trails are natural or not, ‘cloud’ cover derived from aviation emissions is the sole cause of virtually all of the unusual weather and warming. It is abundantly clear when we examine images of skies over the Arctic why the Arctic is warming and why the Antarctic is expanding. It is a scientifically recognised fact that thin cloud and cirrus cloud, such as the many types now created by aircraft, cause the atmosphere to warm. This is due to a process by which some types of radiation can pass through on the way in, but are then not able to reflect back out. Also the cloud layer, though thin, acts as an insulation layer keeping much of the ambient heat trapped, gradually increasing temperatures. 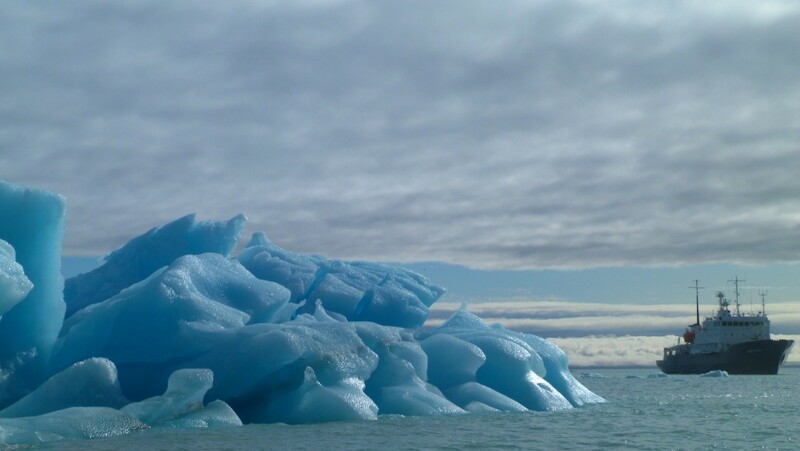 The Arctic skies feature near constant cloud formations derived from aircraft emissions, which in turn warm the surface ice causing it to melt. 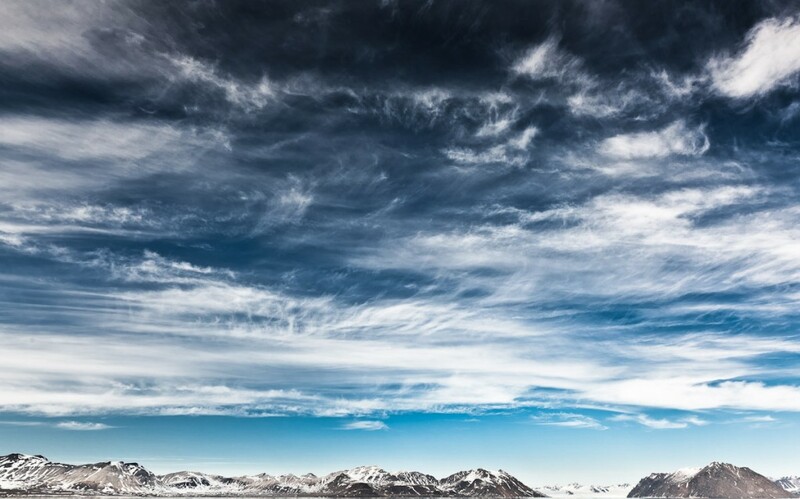 Both of the types of cloud cover featured in these images of Arctic skies are formations derived exclusively from aircraft emissions. Aviation is melting the Arctic and yet we are not told that in favour of CO2-related Global Warming hysteria. If it were natural for aircraft to make clouds the simple solution would obviously be to re-route aviation away from the arctic but then the simple solution does not allow for media fear-mongering, so it is never mentioned, and it also does not allow for the opening up of trade shipping routes and arctic oil exploration so the situation is allowed to continue unabated. The supposed ‘Fact Sheet’ is a jaw-dropping piece of disinformation the likes of which we have never seen and literally caused tears of laughter when we read aloud. To throw a word back at the author and call it utter garbage would be a massive understatement. Virtually every line is a lie and utter nonsense with no grounding in science whatsoever. 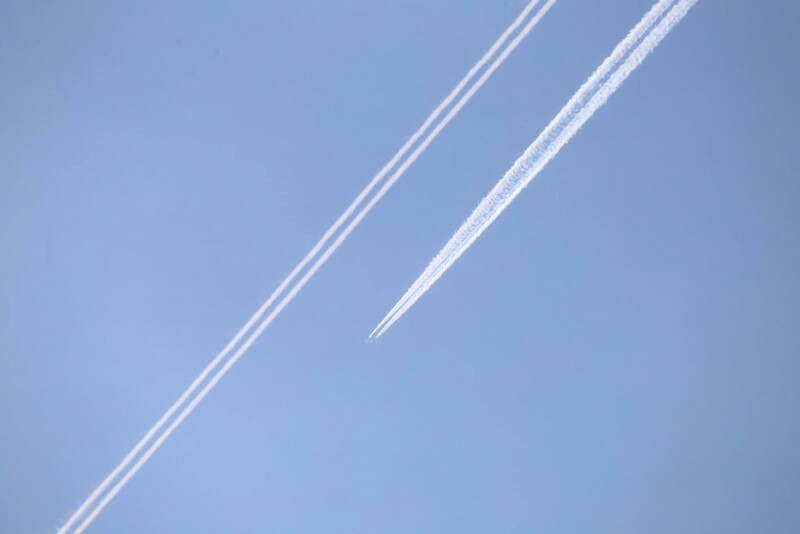 Why do some contrails disappear almost instantly whilst other are long-lasting? This is dependent on the ambient atmospheric conditions such as temperature, pressure and humidity. 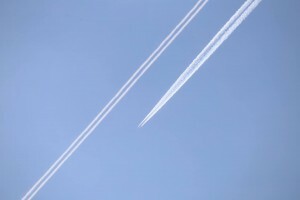 Contrails can grow and continue to spread forming persistent contrails that can last for several hours and become indistinguishable from naturally occurring cirrus clouds. So firstly, water vapour ejected from a jet engine cannot increase in volume over time. If a fixed mass of anything spreads, it thins, a scientific principle even children can understand easily. Secondly, how come we often see 2 Airbus A320 aircraft, traveling very closely at the same altitude across an entire sky, but one is leaving a long trail which persists and spreads to forms cloud, and the other a shorter trail which dissipates very quickly. In fact, closer inspection reveals the trails are even different colours and look and behave differently as they are ejected. That simply is not possible if this were just water vapour. This is even before we begin to consider the fact that both of these aircraft are traveling very low, 22,000ft, well below the minimum altitude required for an aircraft to leave any trail at all. This behaviour is often witnessed over the UK and we termed it combination therapy. We were not aware of this document until now, so we were delighted to read it as it gives us the opportunity to officially accuse our government of directly lying to us. Until now they have been vague and non-committal, with typically evasive responses such as “...we have not seen any evidence to suggest…” but this is hard evidence. We will publish a full response to the Fact Sheet very soon as we don’t have the time or space to include it here. Suffice to say though that if a seemingly intelligent man such as Monbiot refers to such a laughable document then he clearly has not looked into this very carefully, or he an agenda. We can’t comment on the essay as we have not seen it but it seems quite ludicrous for Mr Monbiot to accuse the editor of a major environmental magazine of distributing garbage. Surely most environmentalists who have come round to accepting that the official line is simply not true and to acceptance that our information is a far more accurate representation of what we are seeing and experiencing cannot also be consider to be delusional or paranoid. We think that speaks volumes about him and his allegiances, and would guess that he also tries to insinuate that Mr Corbyn is an insurgent and that almost everything from flooding to mass immigration is caused by Global Warming. Same gang, same script. “Three huge global corporations now own almost all of the world’s airlines. Yes that is exactly what we and tens of thousands, or even millions, of others now think George. It is a shame you think we are all mad, but maybe that says more about you than us. The Global Warming hoax, re-branded Climate Change due to no warming having occurred, is now in tatters and only the mainstream media, mates of our leader and members of the Poli-Com Mafia are now keeping it alive with increasingly desperate and incredulous headlines. Sadly, over time, we have come to realise that your employer – The Guardian – is one of those papers, so we can understand your eagerness to administer mouth-to-mouth to this quasi-corpse of a theory while simultaneously both agreeing with and trying to rubbish the real cause, but you are not fooling most people and like others of your ilk, in the process, you are also exposing yourself as complicit in said hoax. Obviously some will accuse us of finger-pointing whenever anyone disagrees with us, but that is misunderstanding the situation. We encounter many people on a daily basis who show a healthy amount of scepticism when discussing this topic and we expect nothing less. It is perhaps the hardest thing to understand and accept as it challenges everything we think we know about how society operates, or is run to put it more accurately. One of the most important things we have learned in the 3+ years we have been doing this, is the language and tactics of those whose job it is to try to protect the illusion. To us it is immediately apparent and easily distinguishable form genuine scepticism. We are currently preparing an article titled Endless days of grey – The unnatural sky. The entire month of November was grey (at least over London) during the day but strangely at night – when there is no aviation – we had mostly clear skies with clean, crisp air. Even the BBC reported that November had been the “dullest month on record” so sorry George, wrong again. Fact. Check. Perhaps. It doesn’t take a genius to work out that it is impossible for natural weather to achieve that. Are we to believe a new weather system has crept in at dawn every day, sat there all day, and then gone home on the last tube to reveal a clear night sky, only to reappear again just after the planes start to fly over at dawn? Then when we look at satellite images of the skies over England we see clear signs that the thin cloud-like layer that covers almost the entire country is derived from spreading trails from aircraft. We also note that on the few mornings where the trails have not already covered our sky that the temperature is far lower than when it is cloudy, so once again we arrive at a situation whereby it is reasonable to conclude that aviation is keeping our atmosphere unnaturally warm and unnaturally grey. So why are “they” doing it? Well, it depends which part of this website you read. On some pages it claims that the contrails (or “C********s”) are being used to “manipulate the CO2 figures”. This will then justify the mass re-engineering of the atmosphere. On other pages, the contrails themselves are being used to re-engineer the atmosphere, using unspecified chemicals to change the weather. It is a shame we cannot insert sound into this page as the whale sound from QI would fit the bill perfectly here. Wrong again George. Firstly the inclusion of the C word is a common tactic of those trying to turn people away from this topic. If you Google the C word you are presented with a mass of utter nonsense and disinformation, everything from aliens and Nibiru to using yoga to protect yourself against. We prefer to stay in the land of science and reason so do not refer to the C word. It inclusion in his article seems designed to lead people to such content thereby undermining serious debate. Yet another clue. With reference to CO2, yet again you misrepresent our information George. There are 3 types or trails. We believe the purpose of the black trails is to raise CO2 levels so as to foster the ludicrous and unfounded CO2 tipping point theory which seems to be the only weapon the alarmists have left in their arsenal seeing as warming has not occurred and the oceans are not rising. The fact that CO2 does not actually cause warming but is beneficial to all plant life on earth is never mentioned. 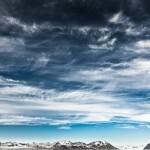 The other 2 types of trails, the fibres and the persistent spreading trails, are to create cloud cover. Did you actually read our website at all? If not maybe try this article. We encourage others not to worry about who they are of why they are doing this for the simple reason it is hard to prove and even harder to understand and serves only as a distraction. We do not encourage people to understand why someone is robbing a bank do we, we encourage them to act. Certainly the most obvious and benign explanations would be that weather prediction is incredibly profitable, especially if the people who own the weather prediction companies are also mates with the people who run the airlines, own the oil fields and the hedge funds; it is a bit like owning the race course, all the horses and jockeys and the betting shops. Quids in ! Another possible reason is the airline industry is inextricably linked with the oil industry, so if they block our sunshine they also remove the competition. Solar power has come of age, but there is almost no sunshine. Get it. There exist a small clique of complicit scientists who are willing to peddle pseudoscience to promote the Global Warming/Climate hoax. We have met most of them and interviewed many and there is no doubt in our minds that they know full well what is going on and are basically lying to support the Poli-Comm Mafia, media fear-mongering. Their reasons remain a mystery, but they are certainly in the gang and on the payroll, at the very least in terms of having their research into Climate Engineering funded. As we say above, we know they are lying, and Mr. Monbiot’s article indirectly agrees with us, simply because they have failed to mention aircraft emissions as the cause of AWG. That says it all really, so I am glad you are on board with us now George. Oh so you have read the entire site then, but chose to misinterpret some of but not other bits. Nice work George. The simplest answer the Fakebook issue is to read our article The 77th Brigade, a 1500 strong army unit set up by David Cameron with the specific task of trolling and con-trolling Facebook pages. In a time when the government is demanding more and more powers to remove our privacy and pry on everything we do on the back of exaggerated terror-phobia, it is not at all far-fetched that they are also trying to ‘discourage’ us from exposing something really massive, dangerous and illegal that they are up to. In fact if they were not, it would be quite odd. Your comments are naive at best , but at worst expose you yet more as a minion. Oh, and one more thing George… try and post the below link of our Smokers film on the The Guardian or any BBC Fakebook page and see what happens. The above link is the strongest evidence to date of modified aircraft spraying substances unknown into our skies. It is absolutely and totally incontrovertible. BUT, if one tries to post it on a popular media Fakebook page, it either will not work, or nobody else but the poster can see it. Below is proof of this, but you can of course try this at home and we encourage you to do so. Open 2 accounts that are not linked by being freinds, and post with one and look with the other. Bingo. Censorship. Quite easy really. Please do try this at home. How do you explain that Mr Monbiot? So unless 77th Brigade are all on leave or too busy drinking tea, then it is entirely reasonable to assume that they might be trying to block the dissemination of the most important piece of evidence to date that shows that airlines are spraying stuff into our skies with the approval of government agencies, but without the approval of the public. Or are we just paranoid George? 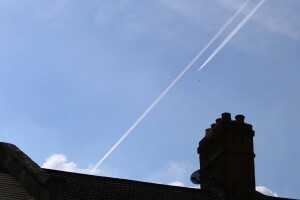 The real, measurable and attestable threat – Climate Engineering – persists because governments are fully aware of its existence and have made it virtually impossible for anyone to do anything about it by stonewalling inquiries and shrouding the airline industry, and crucially also The MET Office, in secrecy and security while simultaneously ‘discouraging’ people from realising that AGW is the result of aviation ’emissions’. It is not hard to imagine that if our governments are in colluding with those who now own all of our airlines in an attempt to take control of our weather, then almost nothing else is beyond the realm of possibility. The real issue – global warming caused by aircraft emissions – calls on us to act. The golden nugget of the speech. We believe this is the first public/media admission of this fact, a fact we have been trying to get acknowledgement for from the International Climate Circus for ages now, and one which they have consistently refused to acknowledge. Reducing our impacts means flying less; something that few people are prepared to do. We simply need to take legal action against the airlines to prevent them from spraying chemicals into our skies that promotes cloud formation and blocks our sunshine, thereby removing the problem altogether. Once that happens the entire illusion will begin to crumble as the rats jump ship. We can then return to natural weather systems and will very soon realise there is nothing wrong with our planet at all apart from the sociopathic people who own most of it and have decided to mess with it. It involves an exhausting battle against a powerful industry and unresponsive governments. It means reading boring papers, attending boring meetings and engaging with a level of political and technical complexity that many people find repulsive. There’s plenty of grind and precious little glory. That is what we are doing, for and on behalf of the public, so thank you for your acknowledgement of the hard work and thankless task we face Mr Monbiot. Despite this seemingly mountainous challenge, taking our campaign off Fakebook and onto the streets has proved an invaluable shrewd decision and meant we are now starting to turn things around as you readily admit. Which is the greater crime we ask; People spraying a dire warming on a temporary hoarding, or airlines illegally spraying millions of tons of potentially harmful chemicals into our skies. Here we have the real clues that this is a concerted effort to undermine not only us, but to dissuade others from taking up the cause. Make the subject seem both futile and ridiculous. Make the reader feel stupid and naive for even considering such an idea. Discourage rational thought and analysis in favour of conforming and following the crowd. Don’t be silly. Calm down and go back to your seat. Nothing to see here. This is a very common tactic of disinformation articles, and is designed to combine denigration by association with a sense that if the reader believes this rubbish then they are as deluded as the people that print it. We are not here because this is exciting. We are not here because it makes us feel important. We would much rather be out enjoying ourselves than having to organise and pay for this campaign but somebody has to to do this and make people realise we are heading rapidly towards an extremely dire situation. Here we have more clues. The idea that the world is chaotic is one which is often touted by those in the know who are trying to give the impression that this is a natural process and the failures of repeated climate summits is simply a result of the inherent incompetence of governments and fallible human nature. We disagree entirely and are deeply suspicious of anyone who tries to explain everything with this misguided notion. Indeed it is this very tactic that is being used to lead us toward the urgency/emergency scenario we proposed on this site some time back. Sadly the establishment has, and very deliberately, managed to convince society to equate the word conspiracy with fantasy, but history is littered with examples of government conspiracies, so it is far from fantasy, but more like an increasingly obvious and deeply disturbing reality born of the greed, corruption and distortion of reality that inevitably arises from vast wealth and power. It is not us who are delusional, it the people who thought they could do this and get way with this. Who thought we would not notice. Who thought we would not care. Wow, did you speak with a psychologist before constructing that one George, lol. It is amusing that one of our slogans is Uncomfortable information is never welcome. To describe the acceptance of current Climate Engineering programs as a comfortable unreality is about as far from reality as one could possibly get. Every day the editor of this website wakes up and wishes this was not happening, and that he still lived in his big house and had a normal life. Sadly, however hard and strange this is, the uncomfortable reality of confronting it is the hardest thing in the world but one we have no choice in, for ignoring it wold be far worse. We can only conclude from this article that George Monbiot has either been forced to write this manipulative drivel, or that he knows full well what is going on and actually wanted to write it to try to dissuade genuine concerned members of society not to confront what is happening, and to go back to accepting what we read in the press. Endless fear and stories about things which our governments will have to save us from by removing our freedoms, right to free speech and encroaching yet further on our privacy, both online and in the real world. Either way, he has exposed himself as one who is willing to promote the official line, spread the increasingly desperate Poli-Comm Mafia propaganda, and continue to flog the increasingly flailing climate-hoax horse. Our information is now reaching and being accepted by swathes of people everywhere. For agreeing with our primary message that aviation emissions, whether natural or not, are the real cause of AGW so government and the media have got it wrong or more likely, have been are lying to us all along. For increasing traffic to our site. As they say even bad publicity is good publicity. Irrespective of what you say, there are many many cleaver people out there who will read your nonsense and realise something is deeply wrong with your message, and then read our site and realise what is really going on. There is one more thing we need to consider. It is entirely possible that this admission that aviation emissions are the real cause of AGW is actually the first step in a change of tactics by the establishment. True it is only by one Guardian blogger but we feel he is clearly part of the ruse and so is acting as a voice. Maybe the feeling in the Corporate Climate Circus camp is that they simply can’t kid us anymore and are testing the water via this quite influential minion Monbiot? Sadly, reality really is stranger than fiction. We are obviously not the only ones who think he has gone to the dark side. This article explains his transformation from eco-activist to corporate minion perfectly. There is no doubt in our minds that he now speaks for the corporations, hence his eagerness to rubbish what we do. George Monbiot’s Guradian Blog.We are pretty sure if one reads this with this in mind, it will make prefect sense. Mr Monbiot, as editor of this website and organiser of the Look-Up.org.uk campaign I invite you to meet and record a discussion on this situation so we can talk more at length and see how much you really do understand. I believe I have the entire situation worked out, both in terms of exactly what is going on and where it is leading us. If you are a true journalist with a genuine concern about the situation then you should welcome the invitation. You obviously feel you know all about it, but there is much we disagree on, so it would be a very interesting discussion both for us and the listeners. I look to hearing from you, or not.